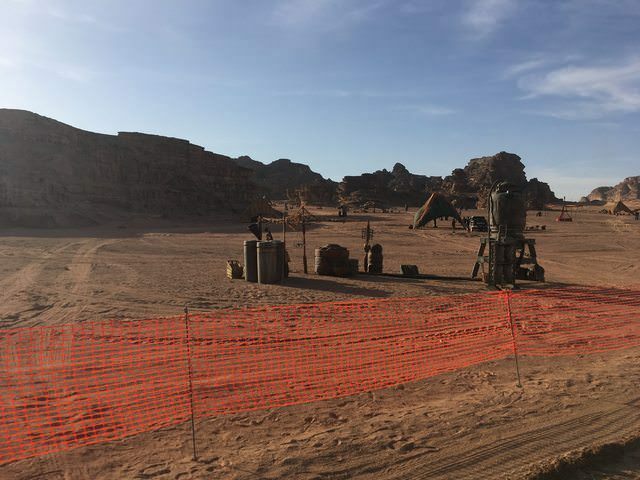 As was reported a couple of months back, it appears shooting for Star Wars Episode IX is taking place in Jordan. Pictures of what is believed to be the set were recently posted to Reddit by user YenaMagana, who happened across the shooting location in the Wadi-Run area of Jordan. While they don't feature any of the main actors or reveal any major plot points, for those who are trying to avoid all Episode IX details we are going to issue a Spoiler Alert! If you don't want to know anything, stop reading now. For those who are interested, scroll down (and don't share this with anybody who doesn't want to know). You can see even more pictures from the set here. The news that Episode IX would be filming in Jordan was first reported back in July by MakingStarWars.net. YenaMagana also says they saw someone whom they think might have been Daisy Ridley on set, though they're not 100% certain of that. They also report having seen several speeders being driven around on rigs, and they were told that they would need to find a different route the following day because there was "filming in a certain area using a lot of pyrotechnics". Jordan has previously been used in Star Wars as a location for scenes on Jedha in Rogue One: A Star Wars Story. It was also previously considered as a filming location for Jakku in The Force Awakens. While there's no way to know just yet what planet we're seeing here, I will say the set dressings look more like something you find on Jakku than what you would find on Jedha. Daisy Ridley possibly being there also might suggest a return to Jakku (mirroring Luke's return to Tatooine in Return of the Jedi), though one could certainly imagine an interesting story about Rey visiting the ruins of Jedha in search of some long lost Jedi secret. Then again, it could actually be Tatooine this time. Wherever it is, we'll find out in December 2019. Star Wars Episode IX hit theaters on December 20th, 2019. The film is directed by JJ Abrams, with a script by Abrams and Chris Terio. The film stars Daisy Ridley, Adam Driver, John Boyega, Oscar Isaac, Kelly Marie Tran, Mark Hamill, Billy Dee Williams, Lupita Nyong'o, Domhnall Gleeson, Keri Russell, Richard E. Grant, Naomi Ackie, Anthony Daniels, Joonas Suotamo, Billie Lourd, and Carrie Fisher.